I met Chris Lydamore at Piddington Villa during the Excavation Open Day where I was presenting a Roman Gardening display. He had a few roman flower pots based on the one found at Fishbourne. He gave me some pots on the condition that I grew a vine in a pot and wrote up the result. I carried out the propagation at The Prebendal Manor, Nassington, Northamptonshire, where I have created a medieval garden. In the small vineyard that I planted, the grape vines are trained up poles in the same manner as the Romans are known to have grown them. 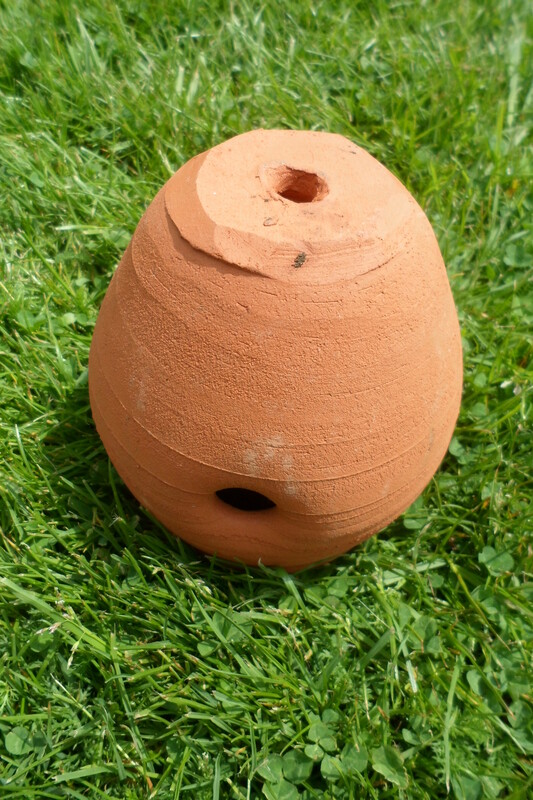 The pot has a hole in the base and more holes around the lower part, just above the base. This allows for good drainage, especially if the pot is left to stand on the ground. A method for growing a new vine was described by Marcus Cato in his book, ‘On Agriculture.’[i] Cato describes how to propagate fruit trees and vines by using either baskets or pots with holes in the bottom. The branch is pushed through the bottom and the container filled with soil. The container can be on the ground or on a pole next to the mother plant. I went down to the mixed coppice that I had planted at Prebendal Manor to provide wood for the manor, where I cut some willow withies. Pliny said that you should grow coppiced willows to produce poles to support the vines and even states how much land you need for a specific number of vines. The willow trees also supplies withies to tie the vines to the poles. Once they have dried the withies can be stored, but must be soaked in water until they become flexible again before they can be used. 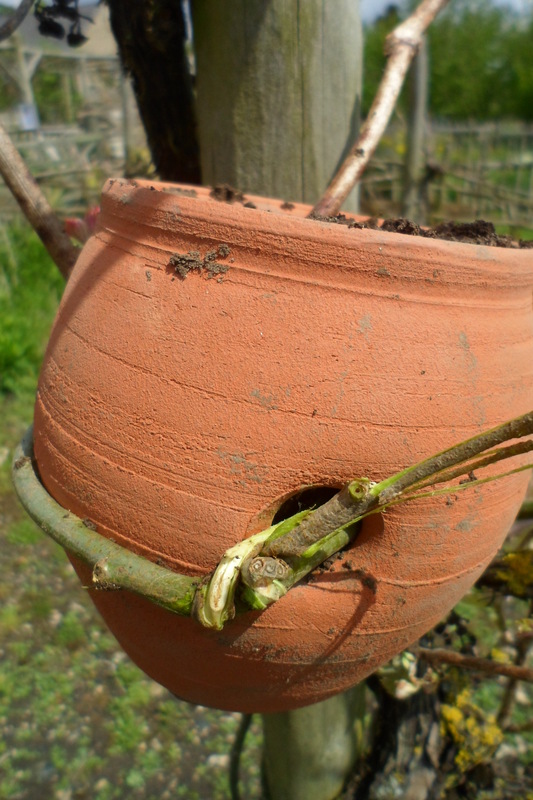 I had propagated vines using this method before after I had read how the Victorian gardeners trained a vine stem through the bottom of a pot to make a new plant. The plant would be allowed to produce a bunch of grapes and the pot and plant would be placed on the table in front of the diner, who would have their own grape vine to eat from during the meal. I discovered that even outside you can easily produce a fruiting plant in one year. 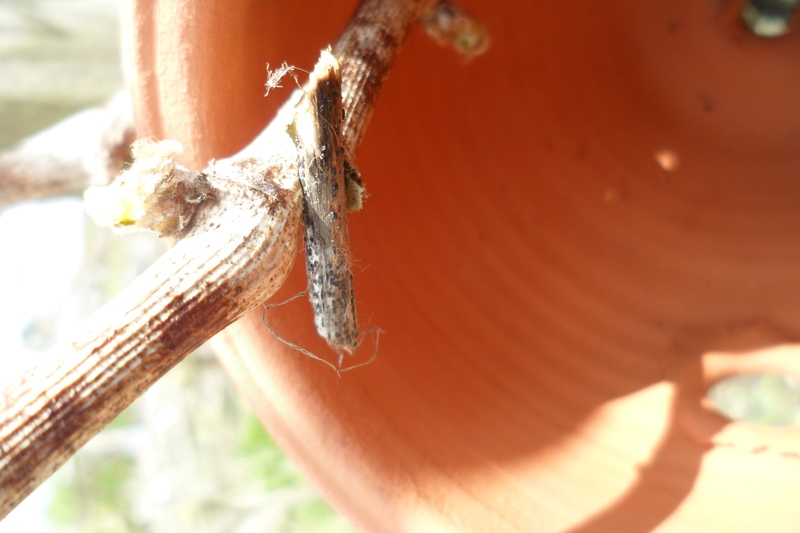 In the spring just as the buds were beginning to form, I found a strongly growing vine with some long stems. Using my roman style pruning knife, I partly cut beneath a node as this encourages rooting. I put a small piece of twig in the cut to keep it open. The vine will grow roots whether you make the cut or not, but it does speed up the rooting process. I pushed the stem through one of the side holes in the pot and positioned the stem until I could keep the pot close to the plant and its post. The vine rod was pushed through a side hole and the cut kept open using a small piece of twig. Prebendal Manor has a mole problem, and on this occasion this was beneficial as it meant that I had some friable soil from the mole hills. Incidentally, Pliny also records a method to kill your moles. Take a whole nut, drill through the shell and remove the kernel. Make a mixture of resin and sulphur and put it into the shell. Light the mix and place the nut in the mole run. The sulphur di oxide will spread through the tunnels and either kill the moles or drive them away. Having filled the pot with soil I tied it to the post using a willow withy. The method of tying is easy; place the withy behind the post, place the vine in front of it. Cross the withy ends close to the vine, being careful not to damage it and then twist the withy ends together to make a tight twist. Push one end over the top or through a gap and trim the ends. The tie will stay in place for over a year and is less likely to break than a string. During the roman period a textile string would have been costly and time consuming to produce. The withies are free. 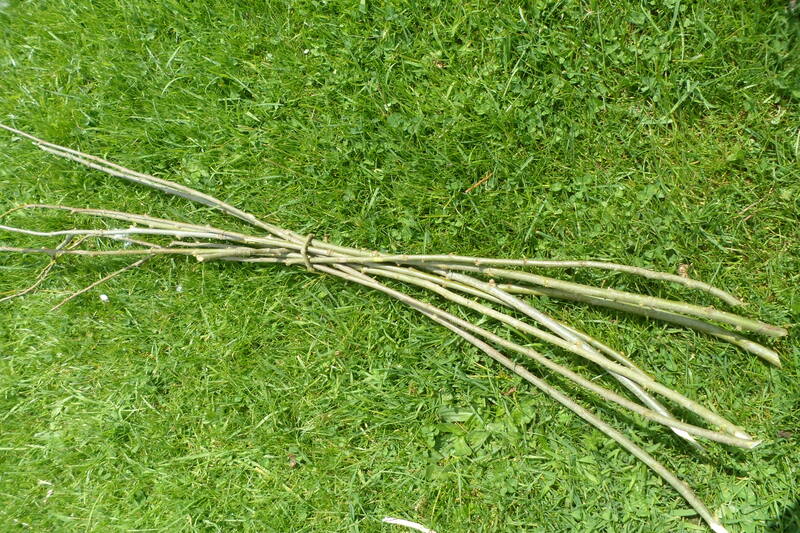 Pliny also suggests using willow bark if you are keeping the withies to make baskets. To complete my task I watered the soil in the pot. 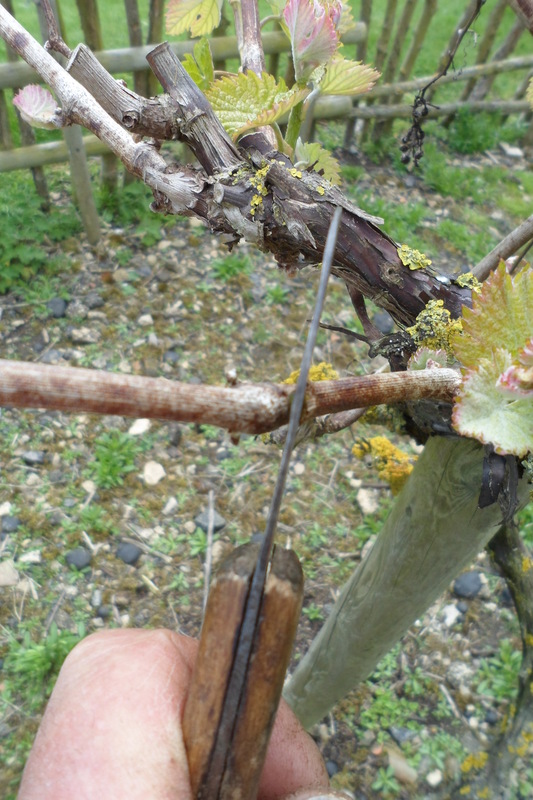 The advantage of this method of layering the vine rather than taking cuttings is that the juvenile plant remains attached to the parent until it has formed good roots. There is also the benefit that it is not quite so vital that you remember to water it. The pot filled with soil and bound to the vine post using a willow withy. The vine rod made good growth, so I cut it back to try to induce rooting. The plant appeared to flourish during the summer, but then I had a problem. There were a series of gales and when I arrived at the manor a few days later discovered that the pole supporting the vine had been blown down and was broken at ground level. Luckily the pot was not broken. 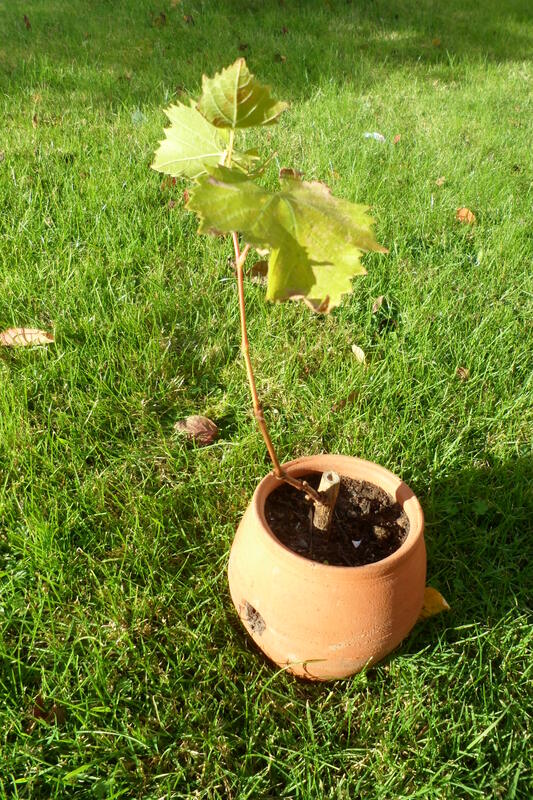 From my knowledge of the Victorian method of growing vines for the table display grapes, I decided to take the chance that the scion had started to form roots and cut it off at the base of the pot and grew it on as a pot plant. Luckily this seems to have succeeded. The new vine plant ready for growing on or planting. Cato suggests leaving grapes for a year and fruit trees for two to make sure that good root growth has taken place. He says that the basket can be split once it has been placed in the growing hole, thus avoiding damage to the root ball. Actually, the basket could even be left in place and allowed to rot if you so wished. The pot would be broken at planting. I have no intention of breaking my pot, so I shall either remove the vine and grow it on in another pot or allow it to grow in the Roman pot and treat is as a bonsai. [i] Cato and Varro, ‘On Agriculture’. Loeb Classical Library, 2006, pp 69 and 113.